When people hear about light graffiti, they probably think that it is just the same as the regular graffiti whice is ‘decorate’ the walls with pictures and images to express their self as artist. However, in this term, light graffiti is basically the graffiti light or light painting. This will be using a camera as the canvas and using light elements as brush. It is a part of the photography technique where people will adorn and make any kinds of shapes and images they like with the contribute of light source. Also known as the light painting, this light graffiti is a special photographic methods and techniques that are using light exposures to ‘paint’ off the images and shapes your want. Since it will be using light exposure, it have to do the method in darkened room or in outdoor setting at night. your need to have the light source – usually portable or hand held – and the camera. It will have to move the camera and the light source to paint the images. Basically, the light source doesn’t have to be visible on the image; your want the shades of the light as the effect. This type of photographic method was first invented around 1935 by Man Ray. At that time he was creating the series of Space Writing, but it was 74 years later on that the creation was discovered by Ellen Carey, a photographer discovering the Man Ray’s special signature. up till now, this technique is getting popular and implemented by lots of people – including amateur and professional photographers. Although both of them come with almost similar name, they are completely different, especially in basic technique and method. In regular graffiti, your need solid surface for the canvas and it will need different kinds of paints or colorings to make your images more interesting and attractive to see. 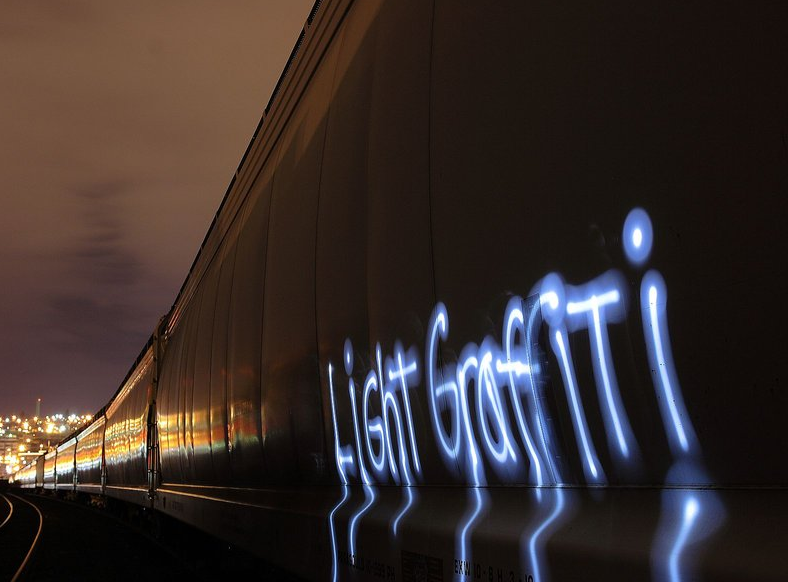 In light graffiti, your don’t need any solid surface as the canvas. The world is your canvas and you are free to draw anything. Your only need to have a light source or sometimes several, to paint yourown design and images. Moreover, when your doing regular graffiti, the result images will still be etched on the walls. Some people who don’ t really like dealing with graffiti will consider these images dirty or unimportant, but the result of light graffiti won’t be staying for long. Once your done with the lights, they are gone and there is no trace at all. 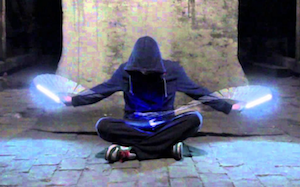 When talking about light graffiti, it is clear to talk about the basic technique and method. Art lighting uses a particular light source that needs it while your making circular motions. In moving the light source, your could illuminate the focal subjects or create painting images by shining the light source directly to the lens. The light graffiti would involve shutter speed in slow move and the light source. Picasso was known to incorporate the same technique in 1949, when a photographer friend, Gion Mili was visiting him. Picasso was making images in a darkened room and Mili was taking the pictures. Since then, the images were known as the light drawings from Picasso. Since the images were requiring cameras to capture the created pictures, the whole technique is also known as the camera painting. The function of the light source as the brush and the camera as the device to capture the images are important to make the result real. Today’s camera can be replaced by webcam as the created images can be visible while the artists are making them. Generally, your will need the basic photo studio equipment to create the light graffiti and it dosen’t need to have sophisticated or modern and expensive devices to create everything. Using a simple flashlight will do. Or your can also use simple fiber optic lighting pen, candles, lighter flints, Poi, fireworks, matches, and glow sticks to create the images. Also it may using a regular camera with tripod. The tripod is important because there will be long exposure on the lights and the images. If your don’t have any tripod, it can place your digital camera on solid surface or support that won’t wobble. Other additional features would include self timer, specials shutter release cable, or color gels may included to color-off the light source. Michael Bosanko. He is a photographer who created the “We Come in Peace” series. The series are somehow funny, creative, and also comical. His creation would include giant spiders on the highway, alien and spaceship, and many other interesting figures. Eric Staller. Stiller was a creative artists from New York who created the light drawings between 1976 and 1980. He focused on the great things found in the Big Apple. Sola. He is a photographer from UK who created “Solid Trace” and “Embro” series. Dean Chamberlain. He managed to create “Psychedelic Pioneers” series in 1977 and he mostly used long exposures to create his work. Learning how to do this light painting isn’t overly difficult. There are lots of light graffiti tutorial available out there. Learning different kinds of techniques can also contribute improving your method in creating unique and one of a kind light painting. And your can see various examples images available on the sites step by step stages to complete the whole set of light painting. 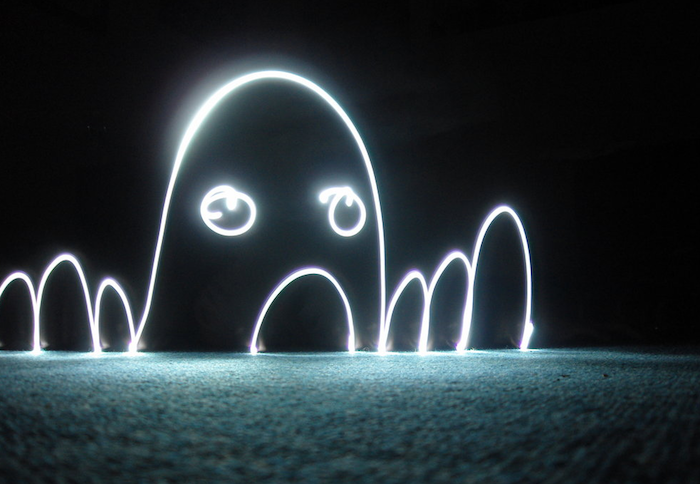 All in all, doing light graffiti can be fun, smart, and creative, especially when your want to create artistic images.